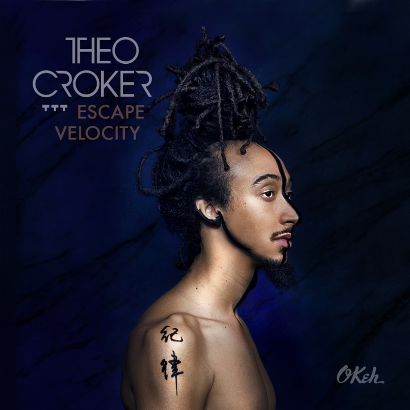 Theo Croker | Escape Velocity - TheUrbanMusicScene.com | Music Reviews! When musicians are ready to hit the professional pavement, many are willing to hone their craft with studio time or side work to make all their financial ends meet while gaining more notoriety in the industry. Born into jazz royalty as the grandson of trumpeter Doc Cheatham, Croker was naturally inspired to follow his own, unique trumpet virtuosity. After graduating from college, Theo Croker moved to Shanghai China, where a melting pot of musical cultures awaited him. In fact, Shanghai ended up being the sanctuary that the Leesburg, Florida native would flourish where fans were willing to embrace someone who could make an artistic impact, no matter what the genre. Adding fuel to his already musical fire, he encountered the much decorated jazz vocalist and mentor Dee Dee Bridgewater, with whom he collaborated on several occasions. With a splendid canvas of organ-infused fusion, “Changes” incorporates power and finesse from the brass section. Engrossed in electro funk with a bass synth kick, “It’s Gonna Be Alright” communicates Croker’s purpose of positivity in the raw chants of the song title and the joyous brass choruses. “The Right Time” seamlessly shifts from an electro chilled dance floor experience to an appealing Latin jazz break. The cosmic flavored, “In Orbit,” dabbles a bit into the avant-garde jazz stratosphere with plenty of funky brass punches. Croker also offers some DJ-friendly material for Escape Velocity. “Love from the Sun,” the Norman Conners classic, is layered with finger snapping rhythms, glistening electric piano and top notch vocals from Bridgewater, who performed on the original 1974 version. The groove-heavy, “Real Episode (Take 9),” could also serve as a theme for a science fiction TV program. Besides the kinetic energy that dominate most of Escape Velocity, Croker and DVRK savor a few precious moments such as “No Escape from Bliss” and the worshipful, “RaHspect (Amen).” Yet the biggest highlight belongs to “Meditations,” a post-bop extravaganza with engaging solos from Croker, Ware and pianist Michael King. Thanks to Croker’s confidence in balancing the art of jazz within several musical contexts and a sturdy backbone in DVRK Funk, Escape Velocity surpasses on every level without any blemishes. Five out of five stars.